The Fern and Mossery: Wearable terrarium? 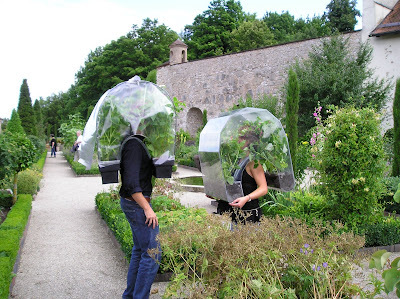 "I believe it is an exhbition by a Belgian artist who created these "personal oasis" greenhouses for people to wear- quite original I would say!!" I definitely agree- quite original. Now my imagination is abuzz with wearable greenhouse items! Top hats! Hoop skirts! Platform shoes!